We have witnessed the cruelty of the Trump regime towards innocent children snatched from the arms of their parents, simply because their parents want to escape the violence and oppression of the drug gangs rampant in their home countries. These parents want not only to secure for their children a life free from being recruited into these gangs, they also want to provide their children with a better life. And most of them did so according to US immigration law. They presented themselves at legitimate border crossings, and were summarily arrested, had their children separated from them, the children, some as young as a few months old, put in cages, or transferred across the country, and placed in facilities where no press or Congressional observers are allowed to see for themselves, except on special guided tours where they cannot speak to the children. Recently, a judge in California ordered the regime to re-unite the children with their parents and effectively ended the zero-tolerance policy. Tomorrow, at 11 am, I, and many others around the nation will take part in a march to protest this cruel and un-American action. The march I will be attending will be held in West Palm Beach and will cross the Intracoastal Waterway by way of a bridge connecting the mainland with Palm Beach island. The march will terminate at Mar-a-Lago, the former home of Marjorie Merriweather Post, heiress to the Post cereal fortune, and that is now owned by the Orangutan. Why am I writing this, and what does it have to do with health care? And what does the Supreme Court have to do with these other issues? That is what this post will attempt to address. To begin with, the immigration issue will have a profound effect on the health care system, as the older Americans get, the more home health and nurses’ aides they are going to need. Preventing these unfortunate men, women and children, fleeing violence and drug gangs, and civil war and corruption at home, will mean that in the future there will be fewer workers to take these and many other jobs in health care and other industries. In addition, the so-called “travel ban”, is really a cynical attempt to impose a Muslim ban without calling it one. The Supreme Court weighed in on this move this week, ignoring the racist comments made by the Orangutan, and gave him wide latitude to ban anyone he does not like. This will have the chilling effect of preventing both medical students and physicians from coming to the US, not only from the countries on the list, but all other Muslim nations. The medical travel industry, also may feel some effect, as providers and facilitators from Gulf states, and other nations in the region, may be prevented from attending conferences and speaking engagements, and Americans who go to the UAE may be given greater scrutiny upon return to the US. On top of the immigration debacle, and the “travel ban”, there was a third and more devastating blow to American democracy and to the Republic this week. The retirement of Justice Anthony Kennedy, a swing vote on many issues brought before the Court, portends that the Court will be radically altered once a replacement is chosen and confirmed by the Senate. But unlike the Merritt Garland nomination, Mitch McConnell is vowing to confirm whatever nominee the Orangutan appoints, and the regime promises to appoint a strict Conservative justice. Several commentators have indicated that abortion, LGBTQ rights, and maybe even health care, could be overturned if one more current justice, most probably Ruth Bader Ginsberg, retires or like Scalia, dies in the next two years. She is 85. Overturning Roe v. Wade and making abortion illegal once again, will force women to seek back alley abortions, and will severely impact their health and lives. Also, it is possible that birth control and access to it, may be denied to women, and that will have serious impacts on health care in the future. Some believe that Roe is settled law, but don’t count on them being right. The Religious Right is waiting for the day that women are forced to carry to term pregnancies they don’t want, and then have any neo-natal or post-natal care taken away, so that they and their babies suffer needlessly. A strict Conservative on the bench also threatens gay marriage and LGBTQ rights, as it was Justice Kennedy who broke with the Conservatives and said that gay people had a constitutional right to marry. It may mean that more cases like the recent Colorado case may be decided in the plaintiff’s favor, albeit without the bias the state Commission showed to religion. Lastly, health care could face enormous challenges ahead if the makeup of the Court swings radically to the right. The current Court ruled that the ACA was Constitutional, but since the coup of 2016, the GOP has steadily destroyed the law and a radical Supreme Court just might put the last nail in the coffin and deny millions of Americans health care. There is also a health care bill in Congress that will remove many diseases and pre-existing conditions from coverage. This is especially disturbing to yours truly, as I have one of those pre-existing conditions: ESRD. Right now, I have Medicare only, but who knows what a radical Court may do to that and the other health care programs such as Medicaid, CHIP, etc. In college, I was taught that the Court generally swings from liberal to conservative, but in my lifetime, it has gone from liberal to conservative, to radically conservative, so that now we may be headed for a judicial, corporate dictatorship where the people have little or no rights, and Corporate and religious interests have all the rights. Well, the march tomorrow morning is a start. I have been critical of those groups opposed to this regime sitting on their kiesters and doing nothing except marching once a year in January for two straight years in the Women’s Marches. This crisis is bigger than just one demographic group. This fight is for the soul of the nation and for the Republic as a democratic republic. A journalist heard this morning on MSNBC said she went to Minnesota recently when the Orangutan was there, and she said that the cab driver told her that he is a Republican, is against the Orangutan, and cannot speak to friends about him because they believe him 100% and think he is a god. Great! Now we have a Caucasian version of Kim Jong Un. The Founding Fathers knew something like this would happen, but never thought that the Electoral College, created to prevent this, would actually make it a reality. We are living in scary times. Have a good weekend everyone, and if I don’t write before Wednesday, have a safe and happy Fourth…it may be our last. This entry was posted in Democrats, Health Care, Immigration, Medicaid, Medical Travel, Medicare, physicians, Republicans, Supreme Court, Travel Ban, Unconstitutional, Undocumented and tagged Abortion, asylum, children, Conservative, Immigrants, Justices, kiddnaping, Legal Immigrants, LGBTQ rights, Muslims, Supreme Court, Travel Ban on June 29, 2018 by Transforming Workers' Comp. The Workers’ Compensation Research Institute (WCRI) released a study today that indicated that hospital outpatient payments were higher and growing faster in states with percent-of-charge-based fee regulations or no fee schedules. This study is an annual study that compares hospital payments for a group of common outpatient surgeries in workers’ compensation across 35 states from 2005 to 2016. 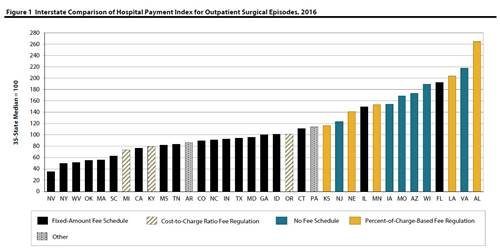 The study found that states with percent-of-charge-based fee regulations had substantially higher hospital outpatient payments per surgical episode than states with fixed-amount fee schedules. Percent-of-charge-based states were 30 — 196% higher than median of the states with fixed-amount fee schedules in 2016. States without fee schedules also had higher payments per episode; 38 — 143% higher than the median of fixed-amount states in 2016. Lastly, WCRI found that hospital payments per episode in most states with percent-of charge-based fee regulations or no fee schedules, grew faster than states with fixed-amount fee schedules. The study also compared payments for workers’ comp with Medicare rates for the most common group of surgical procedures across states. The following chart highlights the variation in the difference between average workers’ comp payments and Medicare rates. The variation was as low as 38%, or $2,012 below Medicare in Nevada, and as high as 502%, or $21,692 above Medicare in Alabama. It means that hospital outpatient payments for the most common group of surgical procedures in Workers’ Comp are not decreasing, and are likely adding to the slow, but steady rise in the overall total average medical cost for lost-time claims, a development I have followed for some time now with the release of NCCI’s State of the Line Reports. This is not the first time I have discussed this topic, and probably won’t be the last, as I keep reminding you that surgical costs for most common workers’ comp surgeries are a fraction of the cost here in the US in countries that provide medical travel services. If this study is right, wouldn’t you rather pay for a surgical procedure in Costa Rica, for example, that costs $12—$13,000, than paying $21,692 in Alabama? Eighteen out of thirty-five states listed on the above chart have higher payments than the median of 100. This represents 51.4% of all the states examined in the study. Just more than half. And this idea of medical travel is stupid, ridiculous, and a non-starter? Ok, keep shelling out more money for hospital outpatient procedures. After all, it ain’t your money, is it? To download this study, visit WCRI’s website at https://www.wcrinet.org/reports/hospital-outpatient-payment-index-interstate-variations-and-policy-analysis-7th-edition. This entry was posted in Fee Schedules, Hospital Fees, MEDICAL COSTS, Medical Travel, Medicare, Outpatient, payments, States, Workers' Comp, Workers' Compensation and tagged fixed-amount fee schedules, Hospital Charges, Hospital Costs, Hospitals, Medical Costs, Medical Travel, Medicare, percent-of-charge-based, WCRI, Workers' Comp, Workers' Compensation on June 28, 2018 by Transforming Workers' Comp. Taking a break from writing about health care, workers’ comp, and medical travel, I want to talk about something I saw, or rather heard yesterday afternoon on MSNBC. It was an audio (furnished by ProPublica) of children crying at a detention center (more like Concentration Camp) that broke my heart. I was in tears, and very seldom do so. But those cries went right to me. If they did to you, then you are a good human being. If not, then you have no soul. And please, don’t quote me that that’s the law, or it is in the Bible, or they are illegal and have no rights. EVERY HUMAN BEING HAS RIGHTS. 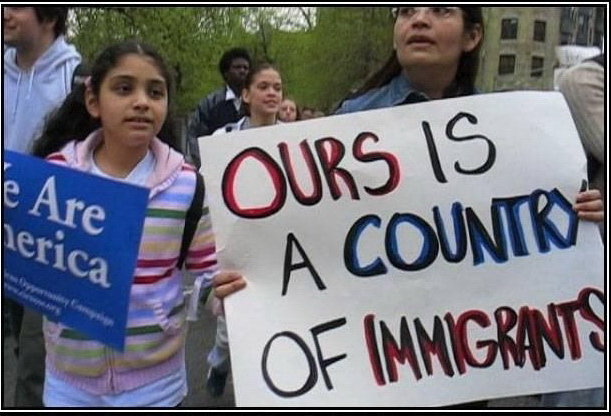 And as for whether or not they are “illegal”, I guess you forgot that when your ancestors arrived on the Mayflower or whatever ship they sailed on, the landlords here for thousands of years knew you were “illegal” too. The ancestors of all of these people now streaming to our border came to this hemisphere some 20,000 years ago, so by those standards, you, me, and all the rest of us are undocumented aliens. But no one tells us to leave. Or yanks our kids from our arms. That we do this and many other things to minorities is a symptom of our greed, ignorance, and stupidity that never seems to die out. Take for example, our Confederate-era Attorney General, Jeff “Foghorn Leghorn” Sessions. That refugee from the set of “Gone With the Wind” is not only a religious zealot, but a full-out bigot and racist from a region of the nation that still has not given up its racism and hatred of non-whites, and non-Christians. In this case, non-Protestants from Catholic Latin America. Too many of our fellow Americans have been poisoned by talk radio, Fox News, and local politicians to see that we are all immigrants and that at times in the long history of the human species, we were migrants too. Our prehistoric ancestors migrated, as did many more recent peoples. But none ever subjected to such cruelty, except during the 1930’s and 1940’s. We were all taught in school to believe in the ideals of America as a shining city on a hill (incidentally, an idea the Puritans created), and was more about a religious view than a secular one. We were all taught about why we fought a revolution, why we have a Declaration of Independence, and why we have a Constitution that secures our rights and liberties. And now we are throwing all that away because of a clique of neo-fascist, racist bullies and bigots, headed by a pathological liar and con man, who has conned a large segment of the American people (by which I mean White people) that he can make America great again, all the while cozying up to dictators and dissing our friends. Folks, this is how Hitler and the Nazis began. And it ended with 6 million dead (my maternal great-uncle, aunt and their six children among them), so don’t tell me it is legal or biblical. You know where you can put that. And those of you who say they have stolen our jobs or they are criminals and rapists, I have news for you…next time you are in a restaurant, or a family member is in a hospital, bus your own table, and clean up your family member’s dirty linen. Because if Herr Miller (Stephen) gets his way, there won’t be any bus boys, nurses’ aides, home health aides, janitors, and other occupations Americans won’t be filling begging for workers. Oh, and you can come to Florida and pick your own fruits and vegetables, because there won’t be anyone to do it for you. AMERICA IS A NATION OF IMMIGRANTS, SO WE NEED THESE PEOPLE. This entry was posted in American History, Federal Government, Global North, Global South, Hispanics, Immigration, Immigration Reform, Latin America, Latino, Legal Immigration, ProPublica, South America, Undocumented and tagged American History, Central America, Hispanics, Immigrants, immigration, Immigration Reform, Latin America, Latinos, Legal Immigrants, Migrants, racism on June 19, 2018 by Transforming Workers' Comp. Tom Lynch of LynchRyan’s Workers’ Comp Insider blog, wrote an article this morning that follows on the heels of my post from yesterday about the Justice Department not defending portion of the Affordable Care Act (ACA). February 2017 – tax cut law that zeroed out the penalty for not having insurance. February 2018 – getting 20 states to sue the federal government and contend that repeal of the penalty obviates the individual mandate making the entirety of the ACA unconstitutional. And just last month, as I wrote yesterday, got the Justice Department to not defend the government in the suit. Tom continues to say that if the 20 states win, pre-existing conditions, which the ACA protects, goes out the window. There are about 133 million Americans under the age of 65 who fall into that category. I am one of them. Insurance companies are not happy either, Tom reports, and the trade association for the health insurance companies, America’s Health Insurance Plans, supports the provision under the ACA, and is quoted thus: “Removing those provisions will result in renewed uncertainty in the individual market, create a patchwork of requirements in the states, cause rates to go even higher for older Americans and sicker patients, and make it challenging to introduce products and rates for 2019,” according to a statement released by AHIP. Finally, Tom asks the question — what happens if the 20 states win their suit? His answer, the 1.25 million Americans with Type 1 diabetes are waiting for an answer. Yet, they and others don’t really have to wait for an answer, because the answer is staring us right in the face, but we refuse to see it, or even acknowledge its presence. Instead, we keep doing the same things over and over again, thinking the free market has the answer. That is patently not true. A real, comprehensive, universal single payer system or an improved Medicare for All system that does not force those who are ill and don’t have a lot of money to pay for parts of the coverage, either the medical portion, or the 20% not now covered by Medicare, is the answer. 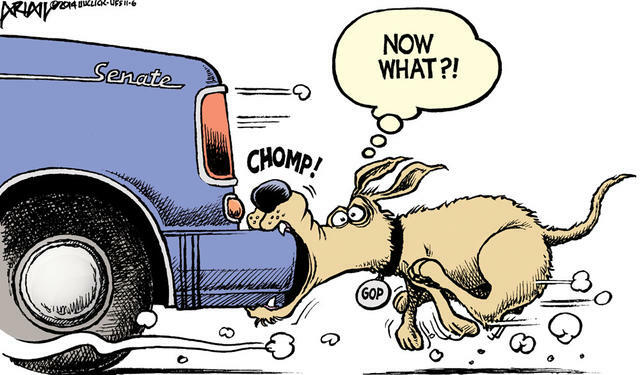 Anything less is just a dog chasing a bus, catching that bus, and the dog and bus getting hurt. This entry was posted in ACA, Affordable Care Act, Congress, Federal Government, Health Care, Health Care Reform, Health Insurance, Health Plans, Individual mandates, insurers, Justice Department, Medicare, Medicare for All, Pre-existing condition, Republicans, Single Payer, States, Tax, Universal Health Care, Workers' Comp, Workers' Compensation and tagged ACA, Affordable Care Act, Congress, Health Care, Health Care Reform, Medicare, Medicare for All, Single Payer, Workers' Comp, Workers' Compensation on June 12, 2018 by Transforming Workers' Comp.